The other day I felt a desperate need for some instruction from the Lord to handle a problem I was facing. I wanted a specific word from Him so that I could simply follow it and succeed. I expected a three step approach with a couple of prayers in the middle. What I got was the scripture above. No specific guidance, just a promise that WHATEVER I commit to Him WILL SUCCEED! I thought about that and then decided to look deeper at the word COMMIT. So I felt like He was telling me that as I TRUST Him and hand over(ENTRUST) my troubles, as I pledge to engage Him, He promises to make WHATEVER I do successful. It's an actual WIN-WIN! I will not lose! I guess that is why the scriptures tell us that if God is for us there is no one that can stand against us. 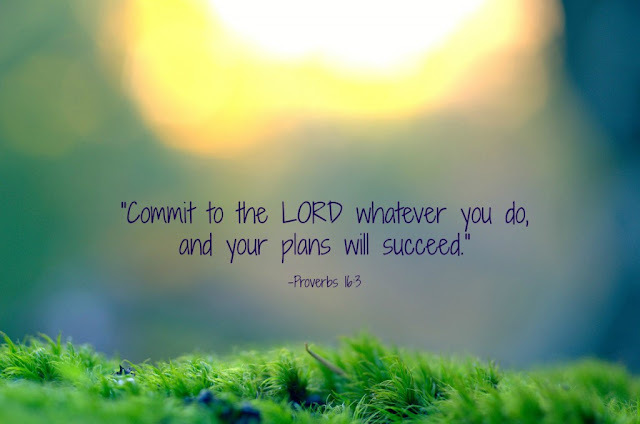 Why don't you COMMIT your personal situation to the Lord. Hand it over to Him to deal with and get ready to watch your plans succeed!